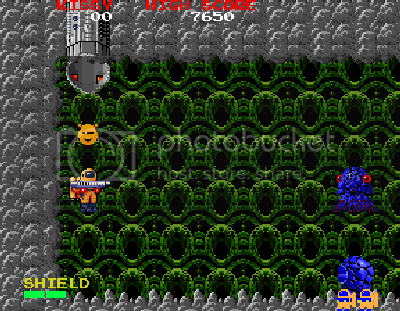 by PaulEMoz in "Alien Sector", "Baraduke", "Dig Dug", "Namco", "Section Z", "shmup"
What a strange little game this is. 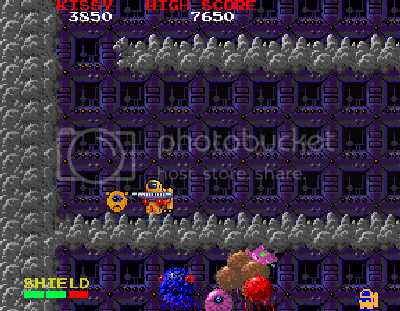 It's another of those odd games on the Namco Museum that I've never played before, and when I first saw it I had high hopes of it being a bit like Section Z, a shooter that I love. It's an odd sort of a shooter, which sees you controlling a player named Kissy. Yes, really. I actually looked up this game, and found that Kissy has a backstory. And that backstory is a corker. Apparently, Kissy married Dig Dug. Yep, that shocked me as well. They had three children, one of which is Mr. Driller. What? They are now, sadly, divorced. Even videogame characters can't stay together these days. You can tell she's a girl. A bloke would shoot that daft cute thing. I tell you, this was shocking revelation upon shocking revelation to me. Who would have thought it? Can you imagine a Japanese soap opera based on this? It would be awesome! Sadly, it's never likely to happen. Also sadly, this is all way more interesting than Baraduke, the game. Baraduke (or Alien Sector, to give it its Japanese (and better) name)sees you venturing through alien landscapes, blasting odd looking creatures so that you can unlock the door to the next level. It's as shallow as that. The creatures (at least, the ones as far as I saw) look like octopii. Some sit there and throw out more octopii that wobble about at you, and shoot laser rings at you. If you blast the ones that sit there, they release collectable things. Look, there's too many nasties down there. You go. There's a recoil action when you shoot... if you don't counter it, you'll blow yourself right back across the screen, eventually. It doesn't, in actuality, have much of an effect on the gameplay... it just looks kind of nice. That's about it, really. It's quite a dull game, and not much fun to play. It's slow, and low-scoring. All it really has going for it is that tremendously involved backstory. Who fancies writing it into a screenplay? Anybody with me?